Before you’ve even uttered a word to a new person you want to meet, smile. Smiling will show the person you want to talk with that you are friendly and it is an excellent way to break the ice. Related to using your smile as in the tip above, is adopting an attitude of being fun. Doing so will make you feel happy and your positive energy will project onto the person you want to converse with. When you go to introduce yourself to a new person, give the individual a handshake and say a simple “hi” or “hello”, followed by “it’s nice to meet you” and then tell, the individual your name. If the person you’re in a conversation with tells you about something, which you also have an interest in, or have an opinion about, then share your knowledge on the subject. This will help you to make a connection with the other person. It’s wonderful if you get into a conversation with someone, where you both connect on an area. Naturally you’re excited to talk about your view on the topic. However, ensure you let the other person do a lot of the talking as well. A conversation is a two-way activity. When you do talk, a technique you can use to continue the conversation, is to interject with a few words. For instance, if the person you’re talking with tells you something, you could say “I see”, or “I get it” and then ask a further question to get more clarification. 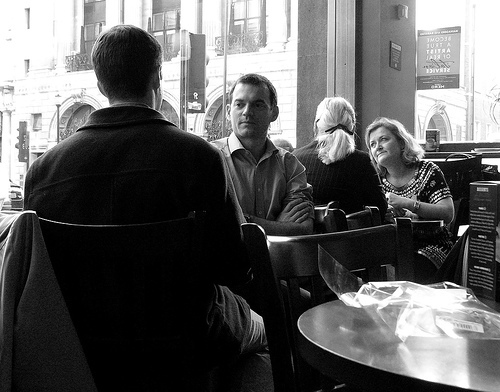 When you’re talking with another person, use your eye contact with the individual. This will help to maintain the person’s attention on the conversation. Use eye contact gently without staring. It’s perfectly fine to look away occasionally, before looking at the person again. Go into a conversation with a genuine interest about the person you want to talk with. Ask questions which will allow the person to open up. This will help you to understand the individual more. You can do this by asking open-ended questions rather than those which require one word answers, such as “yes” and “no”. Another great thing you can do is to repeat back and paraphrase what the person has said to you. This will help you to clarify that you truly understood what the person has said, and demonstrate to the other person that you’re listening properly. When you do add something to the conversation, use your hands to gesture some of your points. This will help you to express yourself more, and you will seem more interesting to the other person. • What other ways can we use to make our conversations with new people interesting and meaningful? I’m glad you brought up this topic as I also come across so many people who have a tough time conversing. Either they don’t know how to get started, which is the toughest part in most cases, or then don’t know who and how to carry forward the conversation. Speaking of myself, I guess coming from an Army background, making conversation was never really an issue with us. We were taught to talk to everyone – no matter what their age may be, and that too in a proper way, just as you mentioned above. Similarly, I’m trying to instill those very same ways in my kids too. I think what’s most important is that when you converse with someone and you know that you share something in common or that you can get along with each other, which we get to know as soon as we talk a few words, is that you just be yourself. If you are frank, honest, straight forward, and just having fun sharing about yourself with others, the conversation flows through very smoothly. Of course, if it’s a complete stranger, you need to be careful not to disclose your personal information, but there’s a lot you can still cover up when you talk. I’m so glad you liked this topic, my friend! Indeed, for some people starting conversations can be challenging. I used to be like this so understand what it is like. Thanks so much about sharing your experiences with conversing. I think it’s wonderful that your family taught you to talk to everyone and also how they taught you to talk with everyone, no matter their age. I think socialising a young person like this in a proper way can really help to increase that person’s confidence in later years. It’s fantastic that you’ve instilled these ways to socialise in your kids! I loved the additional ways you wrote in your comment regarding how we can improve our conversations. What you wrote about being honest and straight forward is very important. Doing so can help to create trust and give the other a person a better picture of how we are. Ah, the point you made about just continuing to talk if the other person is struggling is wonderful! I never thought of this. I can really see how this would make the other person open up! Many thanks for your wonderful comment and for adding so much more to this post, Harleena. Have a good week ahead, too! This is how I managed to get over my social anxiety but pushing through my fears and forcing myself to talk to strangers. I’m so glad you liked the post, mate! I really appreciate what you wrote about your experiences with overcoming social anxiety. It’s amazing how you’ve spoken to thousands of strangers! I can relate to this as I’ve also done similar things. Talking with strangers really does wonders in overcoming one’s anxiety of people. I loved what you wrote about giving value and making people feel good. I think when we go into our conversations with such a mind-set it really does have a positive impact on others. Hi Hiten – thank you for another wonderful post! I loved all your points…especially the smile! I would add my own little take on meeting people and that is carry a deep desire to really get to know people and to learn from them. I think each person that we meet has come into our lives at the moment for a reason. If we look for that reason and stay open the possibilities are endless! It’s wonderful to see you here, my friend and I’m really glad you liked the post! It’s great that you could resonate with the point about smiling. Thanks very much for including the additional way in your comment about how we can improve our conversations, through having a deep desire to get to know people and learn from them. This is amazing! What you wrote about every person coming into our life for a reason is so true! I need to keep reminding myself of this. Hiten, I think the best advice is finding out about otherpeople – genuinely trying to find out more about them and being interested in them. When you get to know people better, you find out what you have in common which not only helps you have a great conversation but also helps you develop strong friendships. The skills that one has to develop to being interested in others is listening. We usually want to speak and be heard in conversations but if we simply stepped back and listened more, we’d register a lot more and can relate to the person more, creating solid conversations and friendships. Also, trying to find ways to be helpful or helping the person you’re talking to connect with someone you know or learn something new or help them in some way is also a good relationship-builder. Thank you so much for including some wonderful advice on developing friendships and having conversations! Absolutely, you’re spot. It is only by showing a real interest in others that we learn about them and find areas of common interest, which then helps us to build relationships. I know what you been about how we always want to be heard. It’s interesting how sometimes when another person is talking, we can actually be thinking of what we want to say next rather than actually listening. When I catch myself doing this, I try and bring myself back into the present moment. I think what you wrote about being helpful through doing those things you mentioned, like helping people to connect with others, is so important. Thank you for sharing this wonderful additional way of how we can improve our conversations. This was a very helpful post for me. I especially like your suggestion about getting the other person to talk. I was having tea with a new acquaintance recently, and I could tell that this person was not that interested in hearing what I had to say, so I kept the conversation focused on him and that worked fine. It might have been one sided, but I actually learned a lot of interesting things. The experience you shared about how you got the person you were talking to, to engage with you was brilliant. I think we as humans in generally like to feel valued and appreciated. By focusing on the other person as you did, it helps to get the person to open up and makes the conversation more balanced. Isn’t it wonderful how we can learn so much from each other, when we open up? Thanks for your wonderful comment, Galen. I appreciate your support and hope you’re having a good week. Conversation’s never been a strong point for me, but I have been getting better at it. Without even trying really. I think it simply comes from maturity. When you begin to find people more interesting it makes conversation so much easier. Because then you actually listen. And listening is half the conversation. I find that simply allowing people to be comfortable around you is the key to interesting conversation. People are just so much more lively when they can be themselves. The key is to reserve judgement. That’s when they’ll open up to you. That’s when the talking gets good. You added some wonderful advice in your comment on how to make our conversations better. In particular, I can appreciate the point you made about getting people to be comfortable around us being a key to good conversations. Also, the point you made about reserving judgement is wonderful. So often we as humans, make judgements of people so quickly. By doing this, we run the risk of our opinions of people becoming clouded. As you said, by actually listening and allowing people to be themselves, it makes the flow of conversation really enjoyable. Many thanks for adding some great tips and contributing further to this post, Trevor. Hiten – This is such a common problem, and I find in such a situation more than often. It is very hard to break the ice as you have said, it is hard for me to connect with a person on the first few occasions, I really take time to get comfortable and people mistake my silence to be uninterested in their conversations. It is very difficult to explain that I am not of the silent nature, and they do realize this once they get to know me, but before that, they might be-friend me for all I know. Yes, the points mentioned above are all legit and works fine I believe, but putting it to practice and finding myself out there, feeling easy in a conversation is hard to imagine. I will surely try to open up after having read this, let us see where it leads. Thanks so much for sharing your experiences with conversations. I can so relate to the points you mentioned, in particular about the silences. One thing I’ve tried to do and this has come from practice is to really become comfortable with silence. When I was first working on this, I used to feel awkward during silent moments. However, I then started to become totally present during those silent moments, free of thought. It takes practice and I continue to work at it. It’s quite interesting to observe, because what happens in some cases, is the person I’m talking with suddenly becomes uncomfortable with the silent moment and feels compelled to contribute to the conversation. I believe with conversation, by treating it as a skill to get better at, it helps take the pressure off and we can just try different behaviours. There will always be lots of opportunities for us to have conversations with others. Thanks for your wonderful comment! I noticed you also left a comment at the previous post about negative thoughts. It had ended up in the spam filter. I do apologise and will respond to this comment later on today. I really do appreciate your wonderful support. Thank you. Hiten, as a card-carrying introvert, I very much appreciate this topic and the practical tips you provided. In addition to your very helpful tips, I’d add that I tend to rely on the context of a gathering to provide an opener. For instance, I used to belong to a group that discusses the MBTI. So, anything related to personality psychology provides a good conversation starter. If I were at a spiritual gathering, talking about something related to what we did before break, for instance, is another way to get the conversation started. Thank you for this very accessible piece addressing an important topic for those of us challenged by striking up a conversation with people we don’t know! Thank you very much for sharing the wonderful approach you use with conversations through situational openers. Indeed, this is a great approach. By opening a conversation through commenting on the environment or situation we’re in, it gives us something to talk about, which we instantly have in common with another person. Many thanks for sharing your experiences and adding further great advice on how we can all improve our conversations. Indeed, as you quite rightly said, open-ended questions are those which any decent salesperson would know how to ask. Many thanks for including the specific words we can use to ask the right types of questions, in order to get people talking! As you said, questions that start with these words will definitely require a response. As I was reading these words, it reminded me a bit of being like a reporter! I appreciate you adding more to this discussion and sharing your views on how we can all improve our ability to converse, Vidya! Thank you. Another beautiful post on how to make conversation By Dr Hiten. This is pretty much everything. I used to be very shy to approach people. I was just too boring. I wasn’t current with latest issues. So this killed my courage. What I did was being update to date with current affairs by reading a lot of newspapers and watching news. This helped a lot. I worked heavily on how to use inviting body language. Like how to smile and not closing myself off with crossed arms. I learned all the tricks you have mentioned and it worked like magic for me. Oluwaseun Babajide recently posted..How I Achieved Google PageRank 3 & DA 40 in Just 3 Months! Thanks very much for sharing your experiences with shyness and how you improved yourself. It is so inspiring to hear how reading and watching the news helped you in this regards, and also the practical steps you took to deal with this issue. What you wrote about getting up to date with current developments is so true. If we want to become more interesting, then it certainly makes sense to learn about more things, so we have more to contribute to conversations. Thanks very much for adding such a great way to help us in our conversations. Hope you’re having a good week, Seun. Many thanks for adding your additional point about making the effort to ask thoughtful questions. I would like to add another point to your comment. When we ask thoughtful questions, this certainly does demonstrate real interest as opposed to questions, which would result in those one-sided conversations, as you mentioned. Thanks for commenting and showing your support, Jon. Much appreciated. Like Harleena, the fact that my Dad was in the Army meant that we went to a new school every two years. Learning how to make conversation and new friends was a survival skill I learned early. I have often found that finding out early in the conversation what a person’s passion is and asking them interested and genuine questions about it goes a long way. Corinne Rodrigues recently posted..How Do You Handle Emergencies? It’s really interesting how your dad was in the Army, just like Harleena’s dad. I can really appreciate how learning social skills would be so important in such instances when families more around a lot. Thanks very much for sharing another great way to improve our conversations, through finding out one’s passion and questioning further about this. This is brilliant. I appreciate you commenting and thank you for your support. These are some great conversation tips! I have found asking good questions helpful when it comes to starting and keeping a conversation going. I also think finding mutual interests can allow the people to connect and enjoy their time together. Great post! I’m really glad you liked the conversation tips in the post! I totally agree with the point you made about asking good questions. I appreciate you sharing this great approach you use, when it comes to continuing conversations. Indeed, it really is great when we meet a person and he/she shares similar interests to us! Many thanks for leaving your great comment, Dan. I really do appreciate it. I am sure there are lots of people who have social anxiety and these tips are really useful. Even extroverts, as so many of the comments here have shown, find approaching a new person difficult. I guess the key is to know the purpose of introducing yourself – getting a date or making a business connection – the purpose will be different, but your tips are relevant in both scenarios. To challenge you, however, all your tips are practical and applicable, but ‘be fun’ isn’t. What does this mean in practice? Indeed, it is interesting. Humans are social creatures. However, a lot of the time it can be challenging to make the initial connection! I liked what you wrote about having a purpose to introduce ourselves. I can see how this would bring some focus to the conversation. Absolutely, in reply to your question about ‘be fun’, this is more of a mind-set than anything else. If one can get themselves into a good mood before the conversation, then it helps the person to be relaxed and hopefully the happy vibes will project onto the other person, as well. Thanks for your question and for commenting, too. I really appreciate you adding more to this post. Ah love this post! I used to feel really awkward walking into a social situation where I didn’t know a soul. My blood pressure would spike. I’d turn red. I’d fidget with my pocket book strap or phone, anything to look like I was busy standing still and alone. Then, someone advised me to seek out someone else who looked equally as uncomfortable and make it my goal to make him/her comfortable. A goal! I like goals. I can do anything as long as I have a goal. So, I attempted this. Now when I walk into a situation when I don’t know a soul, I move from one shy person to the next and make it my goal to get them smiling and feeling good. It really works. One-on-one interaction builds repore and turns what could be awkward fidgeting into a great time. Thank you so much for sharing your experiences with social situations and how you increased your confidence in this area. The advice you got about making it a goal, to make someone looking equally uncomfortable, comfortable, was amazing. I can see how this would work and it’s wonderful that you have adopted this goal-oriented technique to help you interact in social gatherings. Thank you for sharing this approach with us all. I’m going to do it myself! Interesting thoughts on how to start a conversation. I think, in India, we do have have this problem. Indians are chatty enough to be shy. In fact, if you are travelling in a train in India – the person next to you will start a conversation as soon as you look at them. But in certain situations, it can be hard to start a conversation. Thanks for these tips. I’m glad you found this post interesting. Indeed, when I’ve been to India, I’ve met people who are really chatty and others who are very quiet. One thing I’ve never done is travel on a train in India. I would love to do this. Thanks for your comment, Shalu. Hello Hiten, I find it much easier to start conversations online because we don’t face to fce and can express our self’s much better at least for me it is. We are much quicker to hit that keyboard and express our thoughts and make connections with our internet friends. Thanks so much for a great read….. Indeed, I can appreciate the point you made about it being easier to start conversations online. Your comment got me thinking about something. If one is having trouble starting conversations with people offline, then one can use the experiences they have from doing so online and apply the same principles in the real world.